Our society today has grown dependent on its communication systems, its guidance/navigation systems, its electronically-monitored economic system...The list goes on and on. 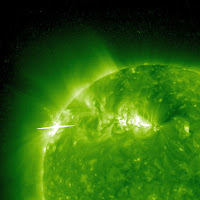 One effect of a direct hit by a CME (coronal mass ejection) would be similar to the blast of a nuclear bomb in the lower atmosphere, causing electro-magnetic disruption of power supplies that would pull down land-line as well as mobile phone systems, internet and cable communications. The complex electronics of orbiting communications satellites would be destroyed, resulting in malfunctioning or complete shut down of global positioning and aircraft navigation systems. The orbit of satellites would begin to degrade, eventually leading to their re-entry into and 'burning up' in the atmosphere. 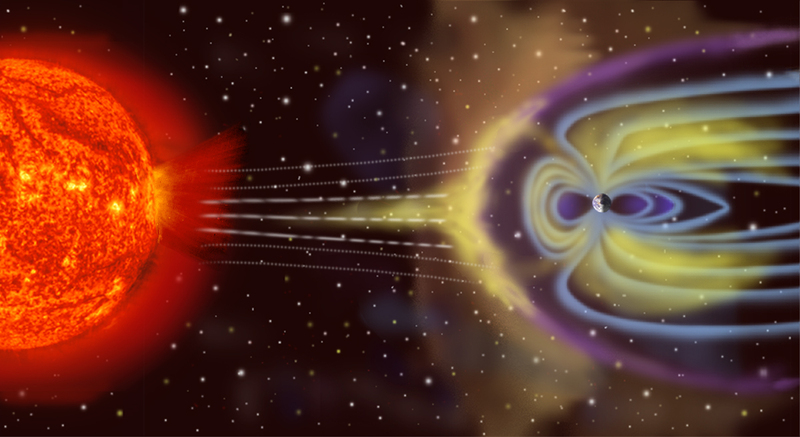 High altitude air travel (such as most long distance commercial flights) would result in significantly increased exposure of passengers and crew to ionizing radiation, especially if the flight were to cross over either of the earth's poles where the magnetosphere (part of earth's radiation shield) has been thinned, warped or even removed by the pulse of the CME. 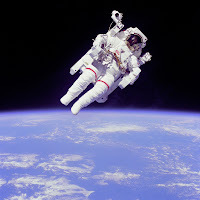 Any astronaut unfortunate enough to be in orbit (even within the spaceship or space station) would be exposed to even more radiation, likely a lethal dose. On the ground, the electrical grid would see transmission relays explode, spontaneous ignition of flammable material (ex telephone poles) and melting of metal wiring. Another perhaps more far-fetched result of a direct hit by a CME is the 'flipping' of earth's own magnetic poles and the triggering of wide-spread volcanic eruption throughout the world. The pulse of the coronal mass ejection would not be felt on the side of the earth facing away from the sun (that is, the night side of the planet). But the exposed side of the globe, if the blast is strong enough to (temporarily) sweep the magnetosphere aside, would receive extreme doses of ionizing radiation, destroying the membranes of cell bodies and disrupting DNA, killing any and all unprotected living thing that may be in its path.